I wanted to do things differently this year for the Cannes Film Festival. Perhaps to simplify my life, but mostly to cover everything, talk about everything, even if just briefly. So I did a diary of sorts, though the daily thing didn’t quite work out… Following is a teaser, for the full piece, check out The Huffington Post. P.S. How much do we love Tim Roth?! ***The Festival de Cannes so far has been overwhelming, and overwhelmingly amazing. Everyone is here, and I mean everyone. But beyond the celebrities, the parties, the red carpets and the premieres, there are films, serious films, wonderful films, sublime filmmakers and incredible actors. And, if you’re lucky and keep your eyes focused on people, instead of your phone (as most industry insiders seem to do as they walk straight into you) you can actually catch the very best the film world has to offer. Right on the Croisette. The festival kicked off perfectly for me as I settled into my comfy seat inside the Palais on Wednesday morning, to watch the first Cannes screening of Olivier Dahan’s Grace of Monaco, starring Nicole Kidman. I expected entertainment from the film and instead, got a lesson in what it means to be a woman, a strong woman. The kind of woman who, I’m convinced if alive today, would turn upside down the chaos of this world. If you wonder why the reviews for Grace were so unfavorable, just check out their bylines. Most, if not all critics are men. And how can a man accept that a woman is a better diplomat and can offer a more balanced view than all the men put together? 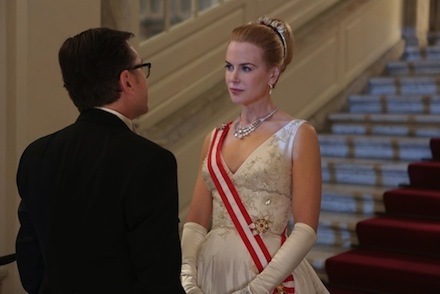 You can find my mini “review” for Grace of Monaco on the Dubai International Film Festival blog, Cinemy. … There is some inherent sexism in the industry. Thierry Frémaux told us that us only seven percent, out of the 1,800 films submitted to the Cannes Film Festival, were directed by women. He was proud to say that we had 20 percent in all of the programs. Nevertheless, it feels very undemocratic, and women do notice. Time and time again we don’t get our share of representation. Excuse me gentlemen, but the guys seem to eat all the cake. It’s not that I resent the male filmmakers. I love all of them. But there is something that women are thinking of doing that we don’t get to know enough about. It’s always a surprise when a woman filmmaker does come about. This entry was posted on Wednesday, August 13th, 2014 at 6:50 am and is filed under Films 2 See, Style Icons, Woman About Town.